Papaya is referred as ‘fruit of angels’ as the fruit provides lot of health benefits. It helps in weight loss, lowering cholesterol, controls diabetics, good for eyes & skin, improves digestion and many more. Papaya milkshake is very easy to prepare and has a smooth & silky consistency. I prefer to have papaya as milkshake than the cut papayas. 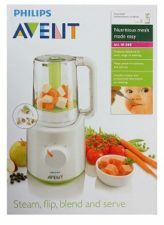 This papaya milkshake recipe is apt for kids and the people who don’t like to eat papayas as such. It is the best way to include papaya in their diet. 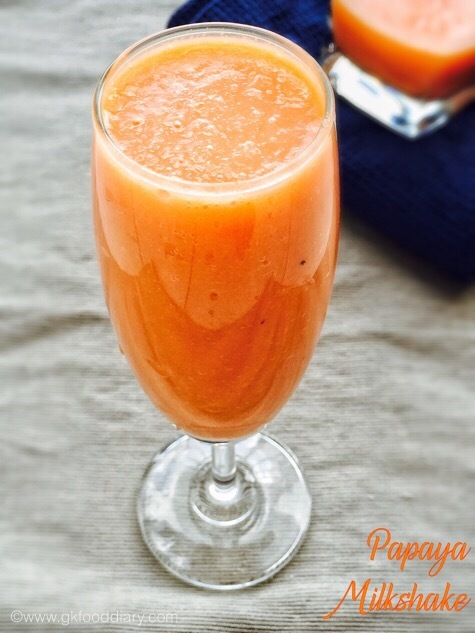 Lets get on to check how to make this yummy papaya milkshake. 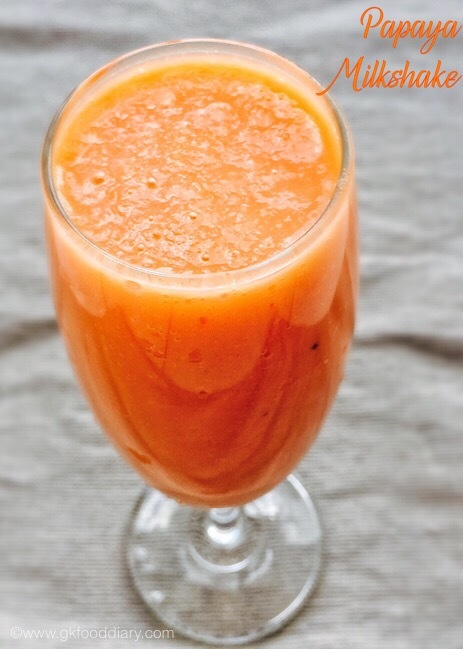 Easy and healthy milkshake with papaya and honey. Wash the papaya in running water thoroughly. Peel the skin off from the papaya and remove the seeds. Also scrap off the white fleshed skin. Then Cut them into equal size cubes. Set aside. Then take half of the milk in blender and add chopped papaya pieces. 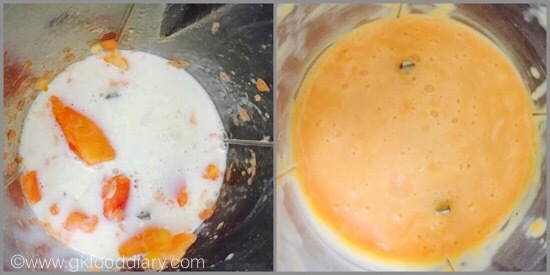 Blend until the papayas are well blended with milk. Now add the remaining milk & honey. Blend everything till smooth. 1. Wash the papaya in running water thoroughly. Peel the skin off from the papaya and remove the seeds. Also scrap off the white fleshed skin. Then Cut them into equal size cubes. Set aside. 2. Then take half of the milk in blender and add chopped papaya pieces. Blend until the papayas are well blended with milk. Now add the remaining milk & honey. Blend everything till smooth. 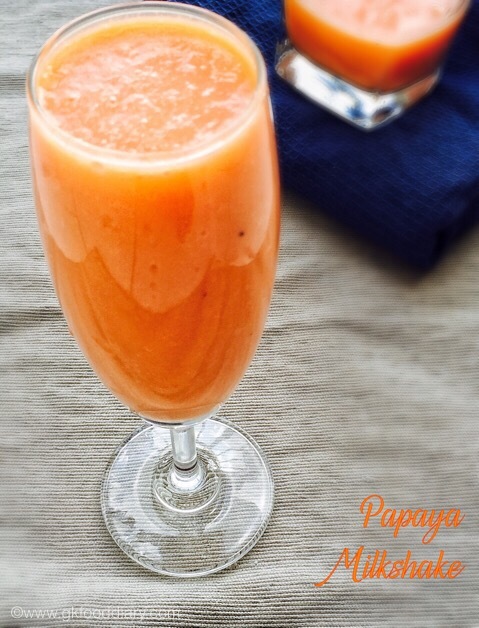 The delicious and healthy papaya milkshake is ready. Serve chilled !!! 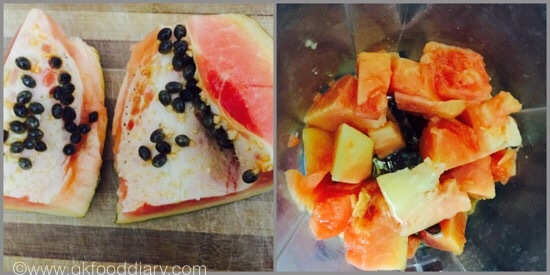 Make sure to remove the seeds from papaya as they make the papaya milkshake to taste bitter. 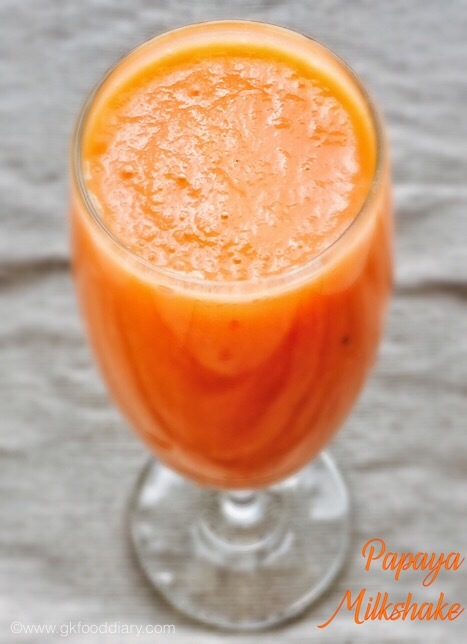 Have the papaya milkshake fresh. Refrigerating is not recommended for papaya as it will give a bitter taste. Choose ripe and sweet papayas to enjoy a delicious milkshake.